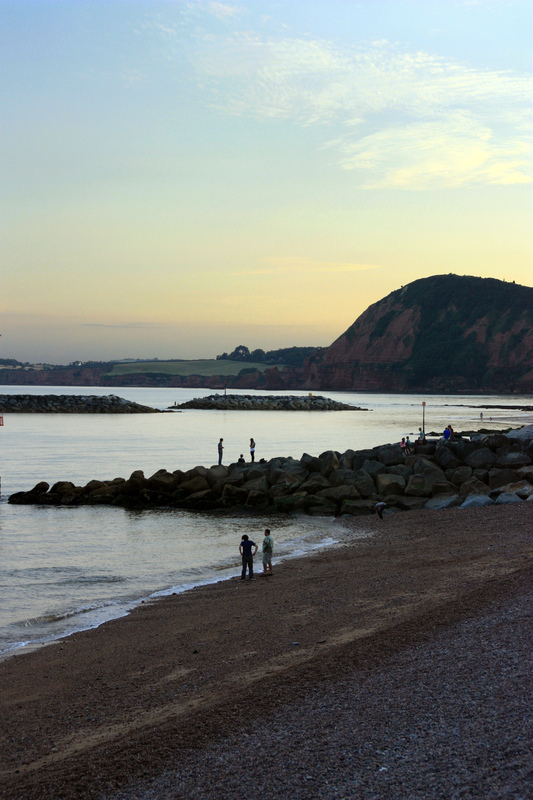 There was a bit of a chill in the air in Sidmouth yesterday, and taking photos with gloves on isn’t the easiest way. But I parked and went east, barely looking towards the sea until I got to the cliff. This area calls itself the beginning of our Jurassic coast, but the stone is in fact even earlier, Triassic sandstone, and a mile or so further east, the cliff changes to chalk, towards Beer on the horizon. I was looking to see if there has been any further erosion. Then I turned back towards the west and the low winter sun. I was immediately stuck by the pink line that looked like a sand bar. It isn’t, just the sun sliding through low clouds. 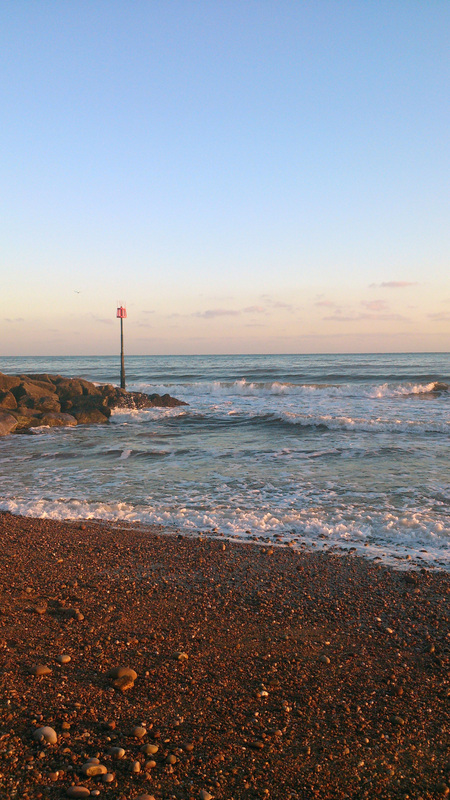 I walked the length of the seafront, mesmerised. The sky became increasingly dramatic. I snapped away happily and stared, probably with my mouth open. The view was lovely right to the end of the path. My hands were frozen by then, so I found shelter, and tomato and paprika soup in my favourite sea front café, Mocha. I even got the best seat, in the corner with a high stool by the window. I didn’t edit these photos, except to make them smaller, and they don’t quite show the vibrant colours, so I’ll have to leave it to your imagination. When the former pilot Keith Owen died, he left his fortune to the seaside town of Sidmouth, to brighten up the place he loved and visited many times. Since then more than 300 people have helped to realise his dream, planting bulbs around the town, making Sidmouth an even lovelier place than before. One of his ideas was to ‘plant a million daffodils’, this has been fulfilled, and the town and areas around it is now a sea of golden yellow and will be every spring. 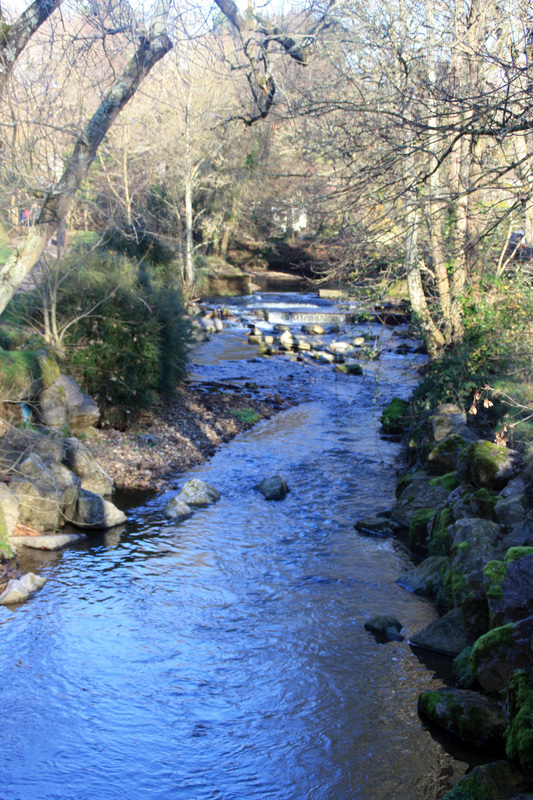 Late on Sunday afternoon, after my walk at the Byes, where many carpets of daffs are blooming, I climbed a little way up Peak Hill where I knew the sight would be wonderful. Puffing my way past the flowers I sat here and enjoyed the view. Once I’d got my breathe back, I tried to get some good shots, but the blue sky from earlier was misty. I walked a little way back down, and the glow as I shot into the sun was dazzling. What a generous soul Mr Owen must have been, and what a lasting legacy he has left! 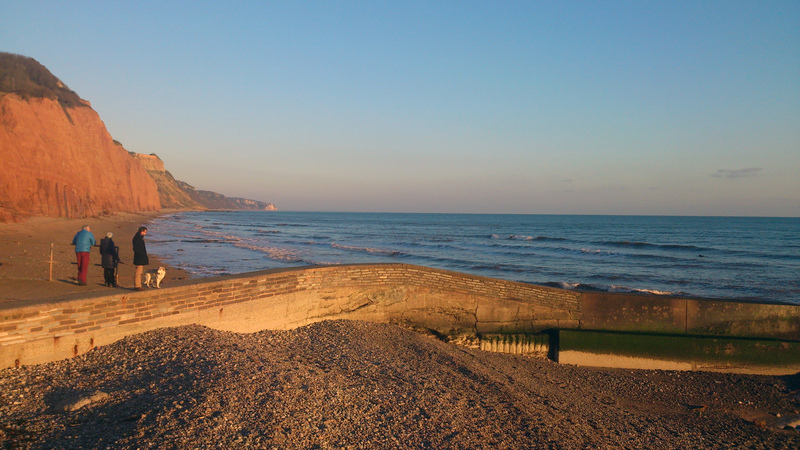 I had a half day on Friday and was keen to see the sea, so Sidmouth it was. My friend and I found a free parking spot right on the sea front, and crossed the road to check out the waves. Looking west they were roaring and churning. and to the east, just as rough and the distant cliffs of Lyme Bay were hidden in the sea mist. We wandered down the slipway by the breakwater. The only shelter from the wind was up close to the wall. But there was more to see on the pebbles, I liked the black and white one and was tempted to take it home, but didn’t. The lifeboat man 😉 stood guard opposite the RNLI station, he’s been waiting there for a very long time. We’ll come back and check the cliffs a bit later. For now we’re having a little respite from the wind, and heading for town. This beautiful and traditional shop, Mountstephen, has been trading since 1902, but way out of my price range. Trumps, a grocers for two hundred years closed down in 2014. It’s very sad to see this once wonderful shop go the way of so many local food shops. They sold fabulous food, but couldn’t make it pay any longer. It’s a Grade 2 listed building, and it looks like the upstairs isn’t going to be converted into apartments. The Square will be elbow to elbow with people in six months time, for the folk festival, but all is quiet on the last Friday in January. The Anchor is a lovely pub, all year round and they host live music and even story telling during the festival. We had hot chocolate and rich, buttery shortbread in a favourite seafront café, Mocha, and then tempted by a bit of blue sky, stepped across the esplanade. I wonder if my eyes deceive me, surely no one would be kite surfing in that sea, but yes and he must be crazy! We watched for a while and I must say I was glad to see him safely back on the beach (excuse the photo, my i phone can’t manage the distance). The empty esplanade is waiting for summer, just as I am. For now we’ll head into the sea mist, towards the cliffs. At the end of the promenade the river Sid trickles into the sea, and it’s no longer safe to walk on that part of the beach, because of the frequent landslides that are eroding the sandstone. Can you see the pieces of wood dangling down from the clifftop? It’s the remains of a fence that was previously beside the south West Coast Path, at the bottom of someone’s garden. Lots of Britain’s coastline is being reclaimed by the sea, gradually washing away. 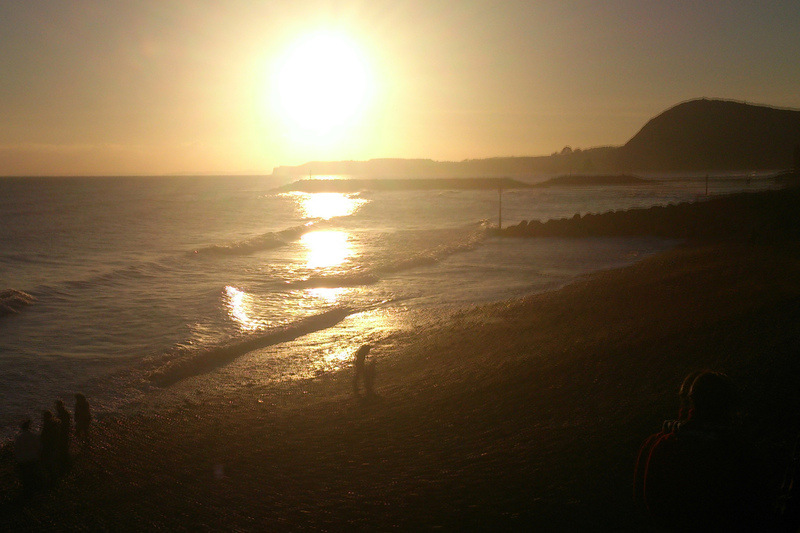 Sidmouth could look very different in a few generations from now. 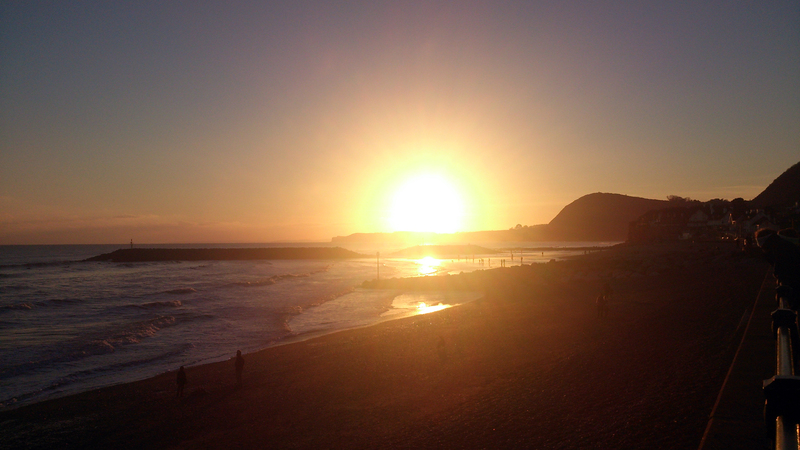 I hope you enjoyed Sidmouth even if it was grey and damp, I’ll take you again in summer. 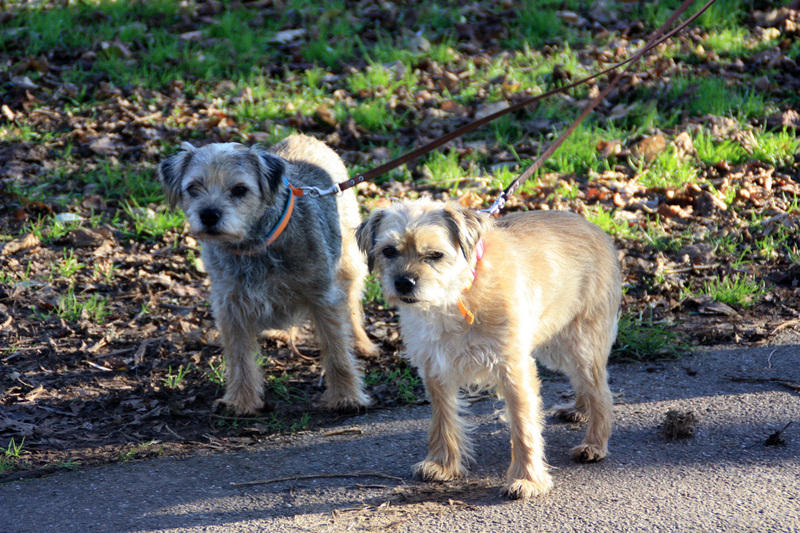 I’m joining Jo for her Monday walk – if I’m in time, but if not this week maybe in a couple of weeks time! I’m really looking forward to summer evenings when I can go straight from work, to the coast for a stroll, a Pimms and a little supper. By then dark evenings like I’ve captured below will be a total blur in my mind. Meanwhile I hope these meet the challenge ! If you click the link you can join the weekly photo challenge of Blur. and continued along past the waterfall. 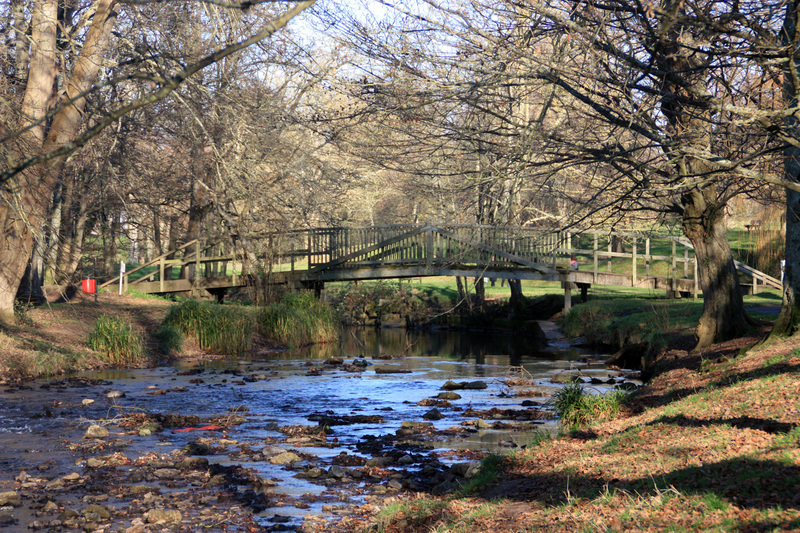 The weather hasn’t been very wonderful for a Christmas walk, this was only a short distance so I need to get an awful lot more exercise to deal with the excesses. Hopefully New Year’s holiday will bring some opportunities! The seaside photos were taken with my phone, I’m afraid I was fed up with carrying the big camera! 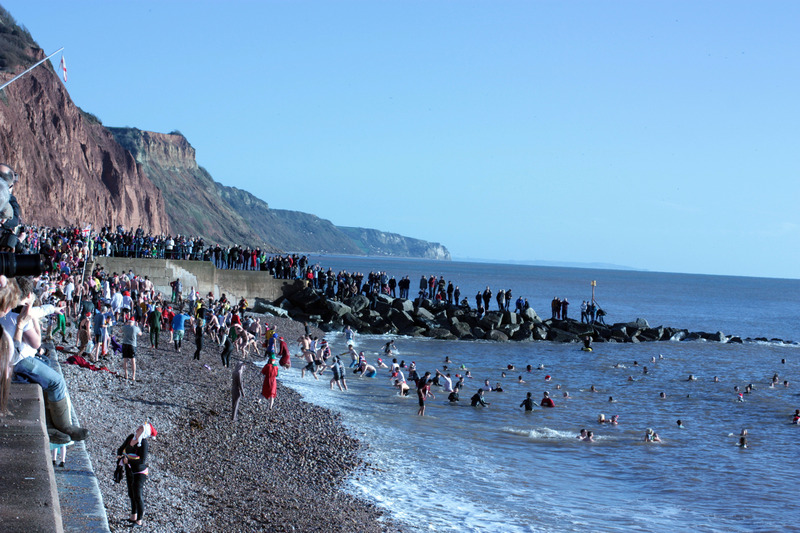 Like many seaside towns, Sidmouth in Devon has its annual Christmas swim in the sea on Boxing Day, December 26th. In recent years numbers have grown from about 50 brave souls to several hundred yesterday, braving sea temperatures of around 11 degrees. I went armed with my camera, hoping to catch the crazy people dashing in and back out shivering, but the area was crowded and I couldn’t actually see anyone close up. I did see some of the swimmers in the crowds beforehand, lots in fancy dress, but I don’t think a bunny suit or a grass skirt helped keep any of them warm! Doubts had been cast about the event going ahead this year, gale force winds were forecast and there were concenrs about safety. 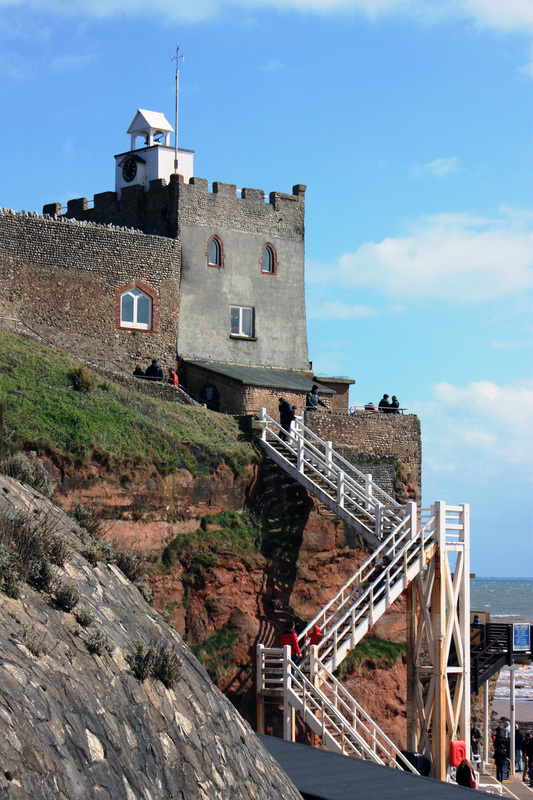 Luckily, the day was mild and sunny and the Sidmouth lifeboat was launched just in case and at 11am in they went. When it was nearly over, I managed to squeeze through close enough to prove that there really were people in the water! Now of course those of you in the southern hemisphere think nothing of swimming in the sea at Christmas, but here even in August the chill can take your breath away. So who has had a December dip and if you have would you do it again? I have, but on Borneo where the water was like a lovely warm bath, and I would have to be in the tropics to do it again! Watch out for the red dragon in Oscar Pearson’s video of the action here. 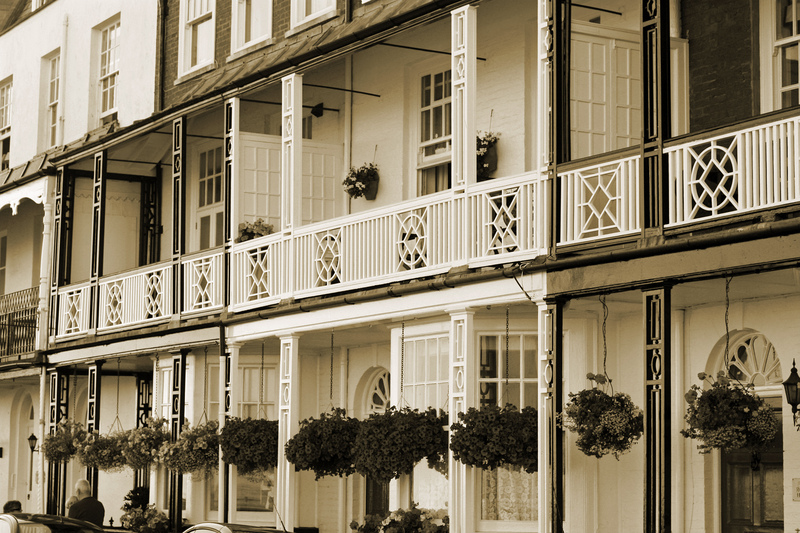 Sidmouth in Devon has lovely Georgian and Regency houses on the seafront, most of which are now hotels. They make a real effort in summer with their hanging baskets which soften the lines and patterns of the windows and doors.